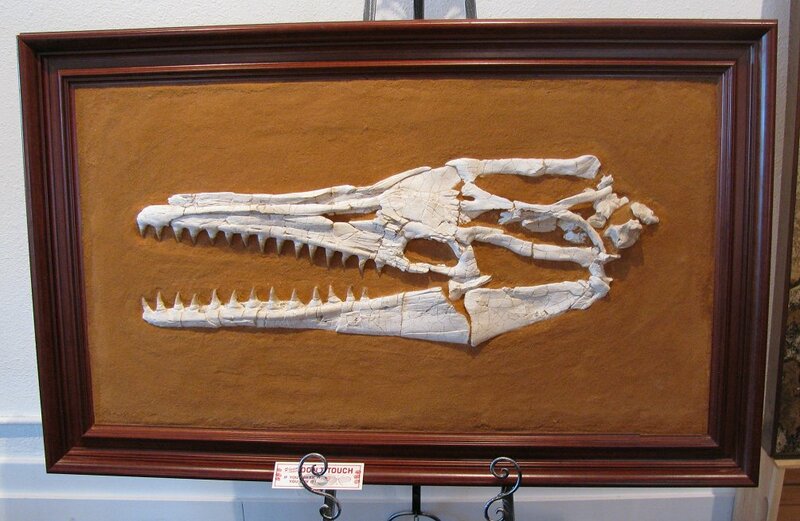 Size: Skull is 34.5" long, frame is 30.5" X 49.5"
Here is a spectacular vertebrate fossil. This is a large Mosasaurus anceps (Mosasaur) skull and lower jaw from the Cretaceous Phosphate Beds of Morocco. TWENTY EIGHT large teeth are still firmly embedded in and protruding from the jaws of this predatory Mosasaur. The teeth are sharp and wonderfully displayed, and the large skull and jawbone are extremely solid - the bone quality is super. The skull has been extracted from the ground and reassembled on the sand-covered mount board. 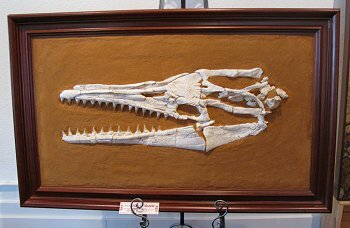 The fossil was then professionally framed for optimal display. Remember, there are OVER TWO DOZEN REAL TEETH in this NEARLY THREE FOOT LONG SKULL! And the skull is not a composite - it is almost entirely one piece as it was found! This is a fabulous, museum quality display fossil from an extinct sea monster - what a conversation piece!